Begin this hike in the Fews Ford picnic area. It is a loop, and is a 3.75 mile round trip. The hike can be lengthened by adding the Fanny’s Ford Trail loop which intersects from the northeast. The trail passes beside the picnic area down to the river and crosses the river on a suspension foot bridge. It continues gradually up hill to a sharp northerly turn where it follows the old Hillsborough Coach Road for a short distance and becomes a loop going over the top and around the base of Cox Mountain. The trail climbs 270 feet in elevation from the river to the hill top. A long steep climb and descent is required. After looping the hill, take the trail back to the bridge. This trail is accessed by hiking the Cox Mountain Trail from the picnic area north to the Fanny’s Ford loop. This trail is a 1.01 mile loop but the round trip from the picnic area is 2.85 miles. The hike is generally easy with only short, gentle hills and a lot of flat terrain along the river. The trail is laced with history. A portion of the route is the old Hillsborough Coach Road, reaching the Few’s Ford river crossing, and passing through the old Few’s Mill race. 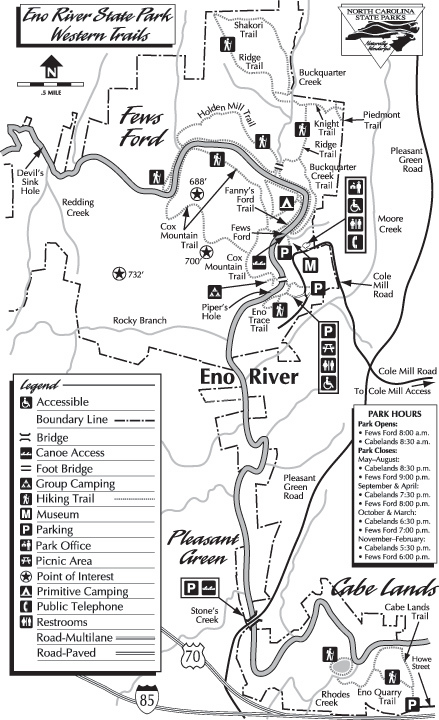 This self-guided nature trail has information stations posted relating some of the history and ecology of the Eno River. Eno Trace turns west off the Cox Mountain trail on top of the bluff between the picnic area and the river. Round trip from the picnic area is 0.5 mile. A short but steep set of steps goes down the bluff from the Cox Mountain Trail then makes a loop beside the river and over a gentle hill. Along the river there is a short stretch of trail with rugged rocky footing. The Wilderness Cabin can be seen across the river. The return is back up the steps to the Cox Mountain Trail. This 1.5 mile loop trail begins at the Piper-Cox Museum parking lot and turns upriver at Few’s Ford. The most spectacular rapids on the river are viewed from a rock outcrop along the trail. A staircase takes hikers over the outcrop. The trail follows the river and Buckquarter Creek, then turns upland going over rolling hills. 2/10 mile along the river is rugged, rocky footing. This hike may be lengthened by crossing the Buckquarter Creek bridge and going west on the Holden Mill loop or following the Ridge Trail north from the intersection. This 2.6 mile combination of two loops continues west from the Buckquarter Creek Trail from a bridge spanning the creek. Round trip from the Piper-Cox Museum parking lot is 4.1 miles. 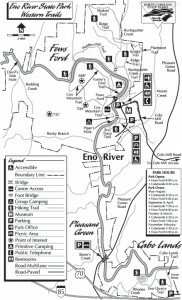 The larger loop follows the river bank 0.8 mile on generally flat terrain but does require crossing short rocky areas and goes up and over a ridge requiring a long, strenuous 250 foot rise in elevation. The smaller western loop is an easy hike around the stone remains of Holden’s Mill. The river segment is characterized by rock outcrops, giant boulders, and frequent rapids. The Ridge Trail is part of the old Ridge Road to Roxboro. Hikers paying attention may see what remains of three 19th century homes along this 1.27 mile route. It starts at an intersection with the Buckquarter Creek Trail and provides access to the Shakori and Knight Trails. At the north end the trail leaves the park at a gate and one of two intersections with the Shakori Trail. Future plans call for the Ridge Trail to be extended north. This hike requires crossing Buckquarter Creek by stepping on large rocks or wading. West of the creek the trail ascends 235 feet over 7/ 10 mile. This trail can be combined with the Shakori Trail to make a loop. This is a 1.04 mile hike, intersecting the Ridge Trail at the south and northwest ends and can be used with the Ridge Trail to make a loop. Hikers may glimpse the chimneys of a 19th century home and the rotting chips of an old saw mill site. From the southern Ridge Trail intersection it follows Buckquarter Creek north, then turns west to include a 200 foot elevation rise up a moderate slope. Blazes are yellow U’s. Future plans call for the Shakori Trail to cross the Ridge Trail at the northwestern intersection and continue south to the Holden Mill Trail. Knight and Piedmont* blazed with red U’s Knight and Piedmont Trails are primarily accesses for neighborhoods off Pleasant Green Road, but any hiker may use them. The Knight Trail turns east off Ridge Trail and goes up a steep hill 0.34 mile to the park boundary. The Piedmont Trail is 0.18 mile of utility right-of –way which crosses the Knight Trail. There is no parking access to these trails. This trail starts from the upper loop of the Cabelands trail and descends a gentle ridge 0.38 mile crossing Rhodes Creek at the base of the Eno Quarry. From 1960-1964 stone was removed from this site for the construction of Interstate 85. After ceasing operation the quarry gradually filled with ground water leaving a 4 acre scenic pond next to the river. The trail continues with a 0.42 mile loop around the quarry rim. Caution should be taken around the quarry. It is dangerous with steep drop offs, no shallow areas, depths at the banks generally exceeding 25 feet, and maximum depths of 60 feet. There are hidden hazards below the surface near the banks. Banks are difficult to climb. For safety, stay on the marked trail. There are openings on the bank suitable for fishing. *These trails exit the park. Enter private property with permission only.